This classic apple pie recipe is a family favourite. Be generous with the apples. 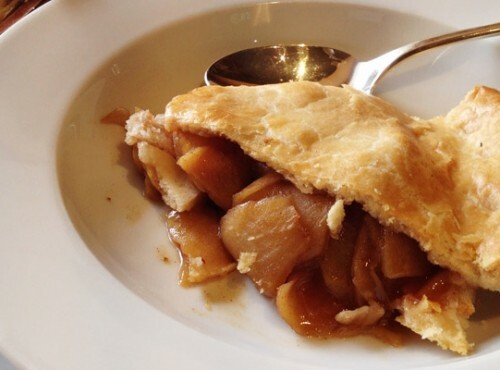 The special feature of this pie is that the apples are added to the pastry uncooked. They need to be tightly packed and piled high. They will subside somewhat as they cook. Preheat oven to 220°C. Roll out half the pastry to a thickness of 5 mm and use to line a ceramic pie plate 24–26 cm in diameter. Mix cornflour, sugar and cinnamon in a large bowl. Tip in apples, then sprinkle over lemon juice and scatter in lemon zest. Mix well using your hands. Pile apple mixture into pastry-lined pie plate. Combine egg and salt to make a glaze. Brush edge of pastry with some of the glaze. Roll out remaining pastry and drape over apple filling. Press to seal edges well, then trim, leaving a 1 cm border of pastry. Pinch edges together firmly. Brush top of pie with remaining glaze and cut 2 slits in the middle so that steam can escape. Put pie plate on a baking sheet and bake for 20 minutes. Reduce oven temperature to 180°C and cook for a further 25–30 minutes until well browned. Allow to cool a little before cutting and serving with cream.